A collection of information on the use of color additives in the food, cosmetic and medical industries. This Third Edition documents important recent developments such as newly listed products, delisted products, modernized specifications and improved analytical technology, new manufacturers and suppliers. A general background of color additives is given including their history, regulation, areas of use and purity requirements. 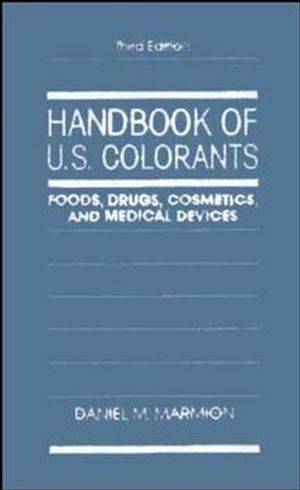 Daniel M. Marmion is the author of Handbook of U.S. Colorants: Foods, Drugs, Cosmetics, and Medical Devices, 3rd Edition, published by Wiley. HISTORY, REGULATION, DESCRIPTION, AND USE. Uncombined Intermediates and Other Low-Molecular-WeightImpurities. Homologous, Isomeric, and Other Related Colorants. RESOLUTION OF MIXTURES AND ANALYSIS OF COMMERCIAL PRODUCTS.